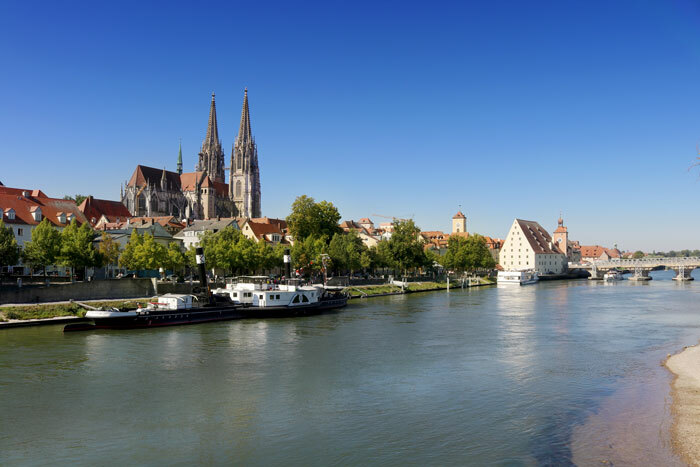 If you’re after an authentic Bavarian getaway while visiting the south of Germany you can’t really look past Regensburg. 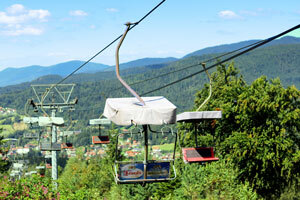 It really offers the perfect combination of nature, fun activities and history. 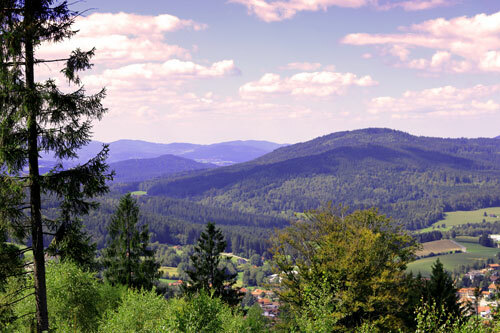 Located between Nurnberg & Munich, the town is split in two by the Danube River. Getting here is easy by car from Nurnberg (1:15 hours) or Munich (2:30 hours) or there are regular train services from both cities to Regensburg. 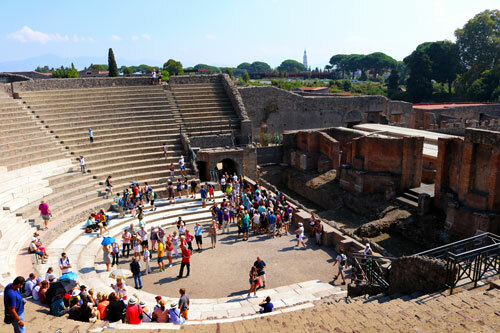 The city dates all the way back to the Roman Empire so there is no shortage history here. A short walk around the city will certainly highlight that. You can see St Peter’s Cathedral from miles around and the city is filled with beautiful architecture. Visiting the Cathedral is a ‘must do’ whilst in the city. Construction started in the 12th century and it was finished until 1520. It backs onto the main square of the city and casts an impressive shadow. Heading inside is equally rewarding. It will take 15-20 minutes to explore the inside and check out the catacombs below. Photos are allowed, so snap away. 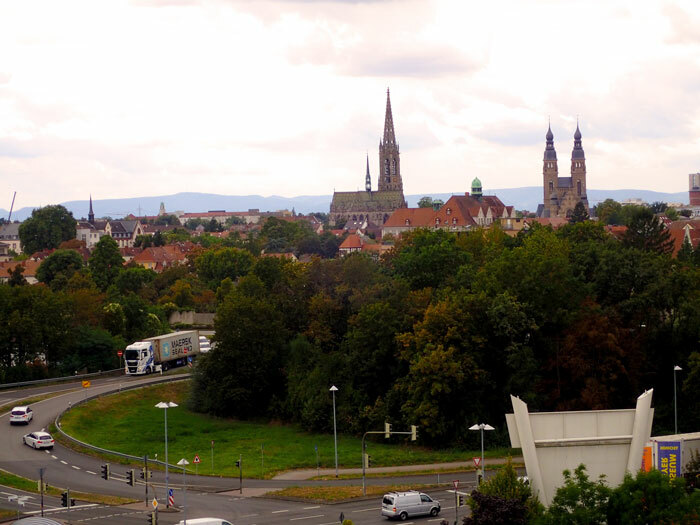 Aside from the Cathedral, Regensburg is full of historical sites. Many of the houses in the old part of the city date back to medieval times and have been well preserved. The aptly named Old Stone Bridge provides unbroken panoramic views of the town and the river, be sure to stop by here to get some amazing photos. It is especially picturesque in the early morning or at sunset. 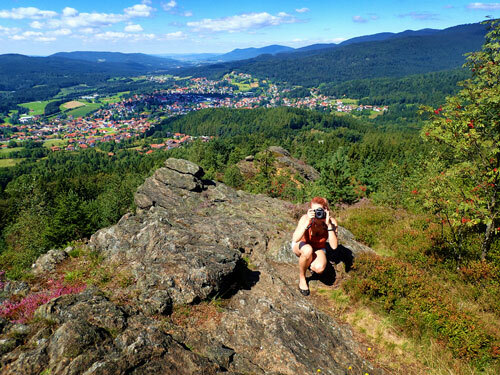 We visited during the summer months which allowed us to do plenty of hiking in the ‘Bayerischer Wald’ (the Bavarian forest, the largest protected forest in Europe). 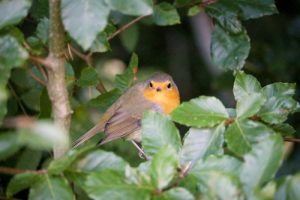 Exploring the nature aspect of the region was certainly enjoyable but if you are visiting in winter then there are plenty of activities for you. If you are visiting in summer, don’t forget your swimwear. 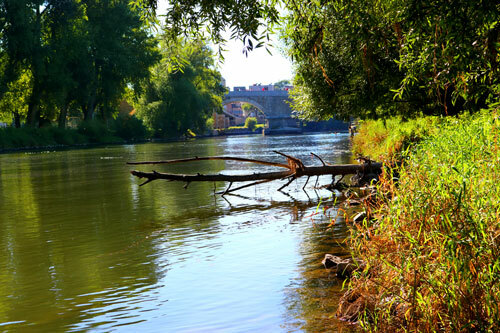 The Danube River provides a perfect swimming spot amongst the trees. The river moves slowly so feel free to float away downstream and take in the sites as you go, just remember you have to walk back eventually! The food scene here is great. There is a huge variety of places to choose from, cafes line the roadside. We thought the food was great and did our best to try out all the ice creameries in town, no complaints at all. If you are stuck for a meal in the evening, we thoroughly enjoyed eating at Namaste Indian Restaurant during our stay. The food was excellent and very well priced. Just don’t make the mistake we did and try the extra hot (‘scharf’ in German) naan bread – it was too authentic for my western tastebuds. Regensburg offers one of Germany’s best Christmas Markets (Weihnachtsmarkt). No one celebrates Christmas better than the Germans and from late November to Christmas eve you can enjoy mulled wine (Gluhwein) and bratwurst while the snow falls. The Christmas markets is not all just about delicious hot food & drinks, there are heaps of stalls selling knitted winter wear, handmade Christmas decorations and everything in between. Additionally, the cold winter allows visitors to try ice skating on the many frozen lakes or skiing if you are prepared to travel out of town. 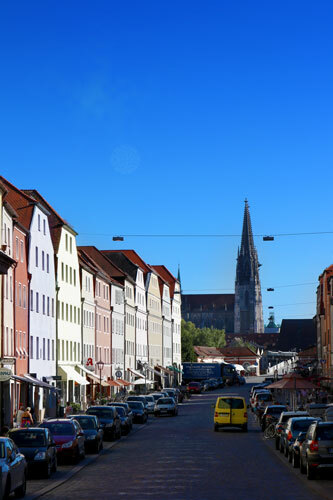 Ultimately, Regensburg is a beautiful city that operates at a very relaxed pace. 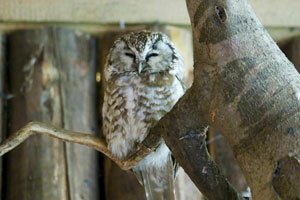 If you are looking to wind down and take things slowly then this would be ideal for you. Enjoy the dining and taking in the sights. We loved it here and walking around with our camera all day was a pleasure. For those who are interested in an action packed getaway, this probably isn’t the place for you. Speyer is a small city in the west of Germany, about 100 kilometres south of the much larger cities of Frankfurt & Mainz. Speyer sits on the river Rhine and is as picturesque as any old German city. Whilst it doesn’t offer the huge number of tourist attractions to compete with many of the other destinations in a limited schedule, we thought it was well worth a day trip and we certainly weren’t disappointed. 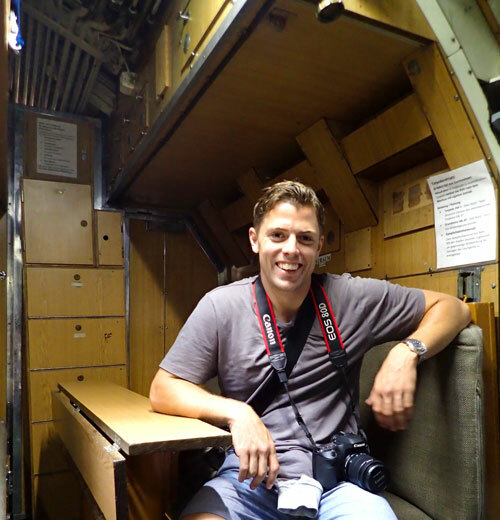 First and foremost, Speyer’s premier attraction is extensive museum that covers everything aero, automotive and even space. 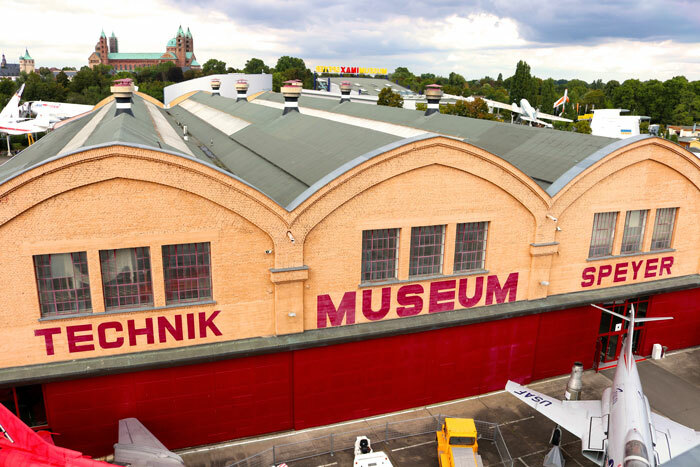 Unlike many museums, the Technik Museum actually offers hands on experiences. I have never come across such an extensive display of fighter jets from all over the world. 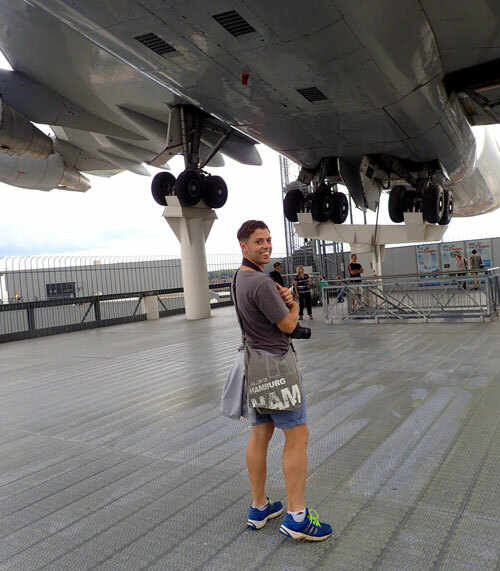 The most eye catching would have to be the Boeing 747 supported 5 stories up! We cannot describe how impressive this museum is, it really must be seen to be believed! You can quite easily spend more than a day working through all the amazing displays. We spent about 5 hours here and there was still so much we didn’t get to see. If you are travelling with children this is a must do! The town of Speyer itself is as picturesque as they come. Walk into the town square and you will be impressed by the massive cathedral that dominates one end. Construction began in 1030 and at the time, was to be the largest church in the world. 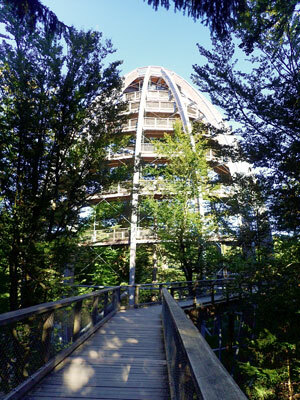 It is easily visible from the outskirts of town, over 5km away. 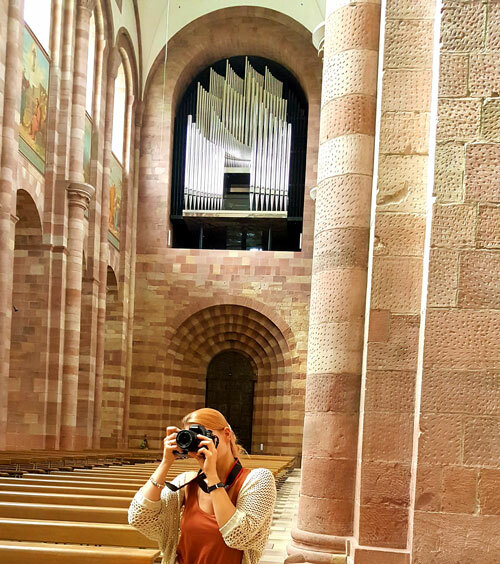 Entry to the cathedral is free and, if you have the time, pay the little extra to climb to the top for an amazing view of the Speyer skyline & landscape. The remainder of the town has certainly kept its heritage intact over the years. If architecture is your thing then you’re in luck. For such a small town, it is littered with beautiful churches & buildings. The town does offer walking tours but they are really not necessary, you can easily find everything yourself and most of the attractions provide historic information. The town does have several other museums in the town covering everything from a sea world to everything historic. Spending two days here would be ideal as the Technik Museum really does require a whole day but one day is sufficient if you are prepared to do the museum in record time. Sitting in the shadows of Frankfurt, the much larger city down the road, Mainz is worth a visit entirely in its own right. 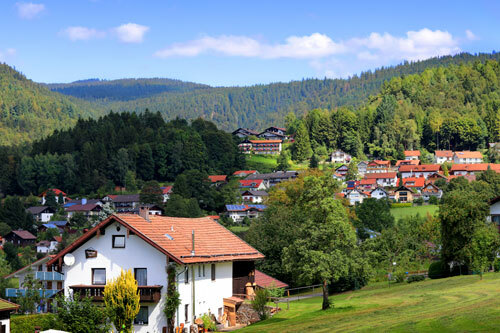 It has more of the charms of a small European city and is easily traversable by all pedestrians as the main township doesn’t extend for more than a few kilometres. 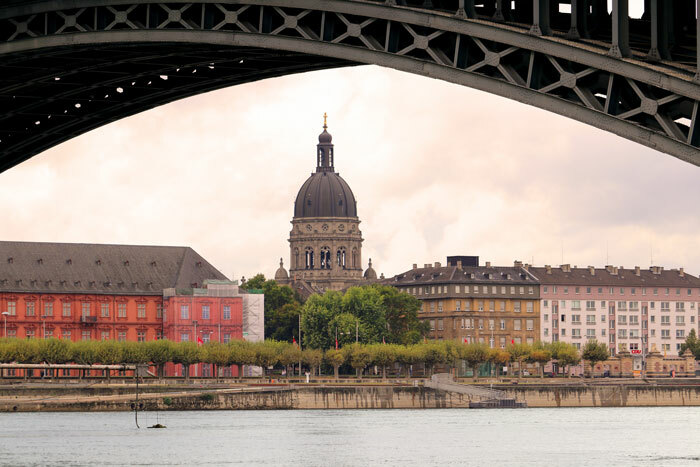 Frankfurt is a far more industrialised city, whereas Mainz is somewhat more suburban with its university catering for approximately 35,000 students. Mainz was first colonised by the Romans circa 38 BC, although this area had been civilised since around 300,000 years earlier. So there is no shortage of history in this part of Germany. The main attraction in town is the impressive Cathedral that dominates the centre of town. If you come into the town centre at a decent hour, there is the option to have breakfast (or lunch, or even brunch!) at one of the many cafes & restaurants that fill the town square opposite the cathedral. 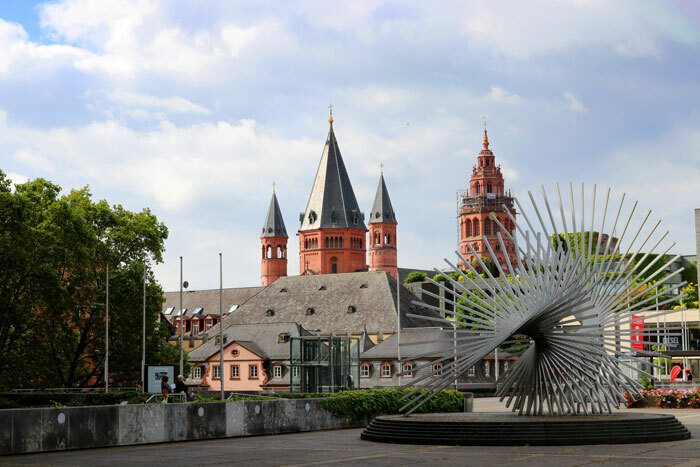 Admire the amazing architecture in the relaxing ambience that is Mainz before walking around the town. After admiring the cathedral over breakfast, we ventured inside for our first stop. 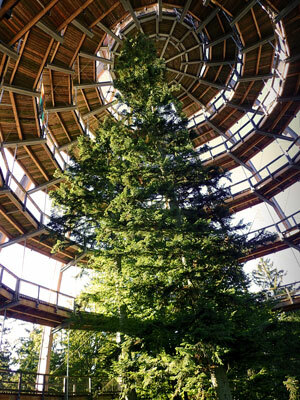 We weren’t sure what to expect on the inside, whether it would be as spectacular as the outside. But surprisingly, it was even more spectacular. You certainly will not be disappointed with visiting here. As with all churches, entry is free. However, please dress respectfully by covering your shoulders. 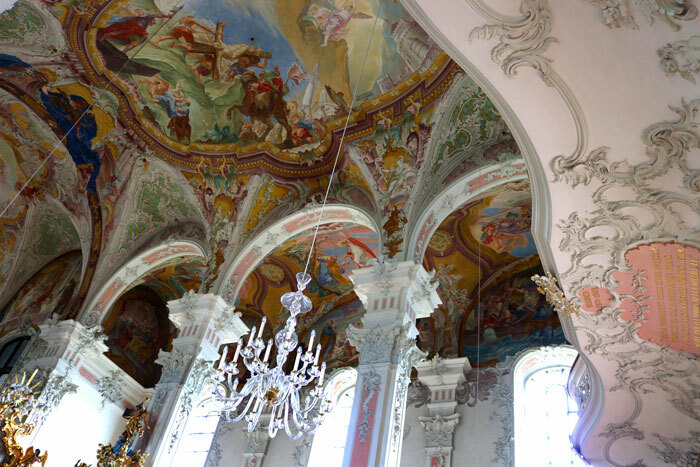 Like the vast majority of German cities, Mainz has multiple other churches around the town and they are all different – we would recommend the church of St. Peter for those interested as the ‘best of the rest’ in town. Mainz also suffered during WWII, when it was extensively bombed by the Allies and 80% of the city was destroyed. One of the buildings destroyed during the war was the church of St Christoph. Built circa the 13th century, all that remains are the outermost walls and the tower. These have been reinforced and the remains acts as a war memorial. It is certainly worth a visit for history buffs & war enthusiasts as the information inside is quite extensive (and it covers English & German among other languages). Keep in mind that there is no roof over the majority of the church, so be mindful of the weather if you plan to visit here. 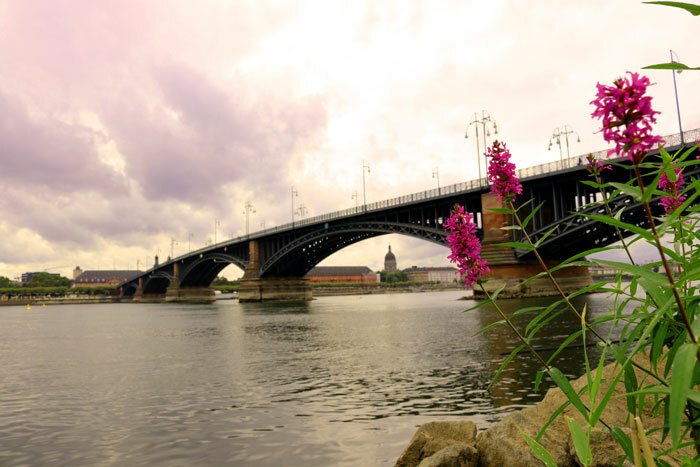 Mainz is set against the beautiful Rhein River, where it meets the Maine River. Walking along the waterfront is perfect for photographers of all abilities and it will provide an endless amount of potential. 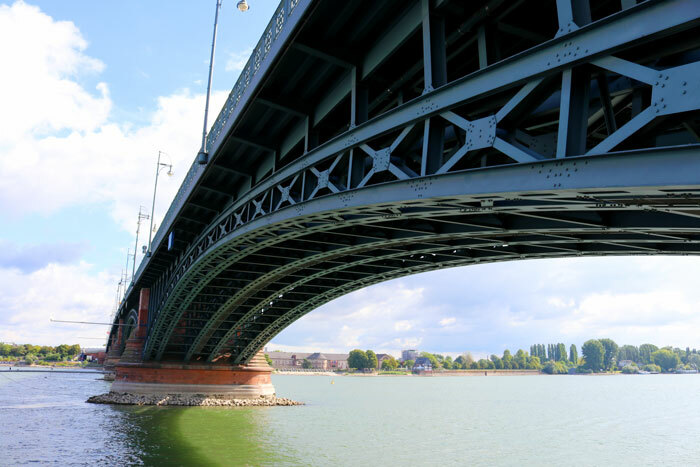 Crossing the Theodor Heuss Bridge over the Rhein River will take you into Wiesbaden, with even more spectacular views looking back towards Mainz. We timed our visit to coincide with the Mainz Wine Festival. It is on every August and runs over two weekends. 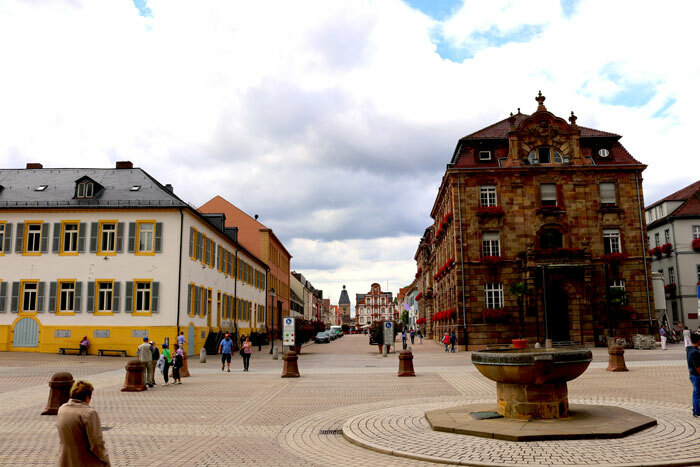 Mainz is one of the most prominent wine regions in Germany, so we figured it would be well worth experiencing. Every year it is hosted in the Rosengarten (Rose Garden) and there are in excess of 40 different wine producers from the region offering tastings. If wine isn’t your favourite then rest assured, there are also a variety of beers & food on offer too. Entry is free and the food & drinks are well priced so make sure you wonder around and make the most of the lovely early Autumn weather. 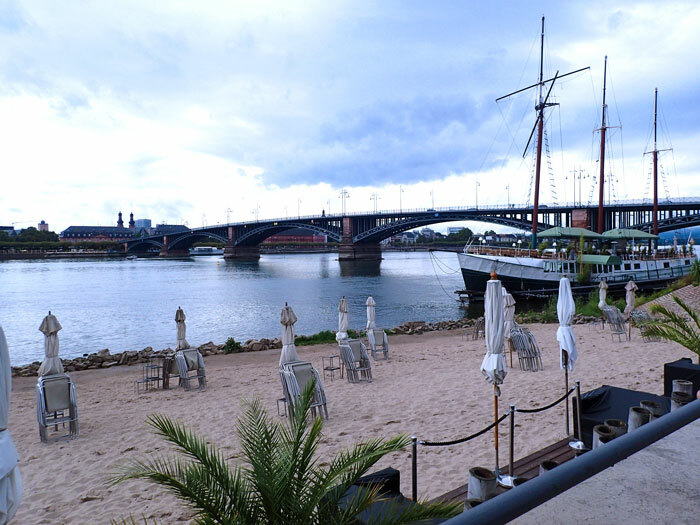 For our stay in Mainz, we stayed at the Park Inn by Radisson hotel. Whilst it was a lengthy walk from the centre of town (about 6.5km, just shy of an hour for the average person), we found the rooms very good value priced and quite close to all amenities. There is a large shopping centre across the road with a late hours service station (which we found great for a bottle of wine and some snacks late at night) as well as a McDonald’s restaurant. Of course there are options closer to the centre of town but we were unable to find anything for a reasonable price due to the wine festival. 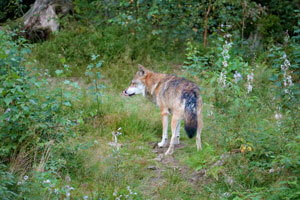 The city of Mainz also offers a guide to the most prominent attractions for walkers. You can find the guide here. We did experience some difficulty navigating the public transport system here, and that was with a native speaker too (don’t worry, the ticketing machines translate into a huge variety of languages – we just couldn’t work out which line went where). And it was also fairly expensive to use. Since the Vatican City is such a different destination, we thought we could provide some additional assistance to ensure you have the most fun possible during your visit here. 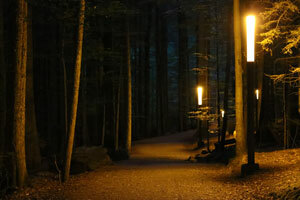 As spectacular and impressive as it is, there are a few areas that may cause you some issues and detract from your visit – but don’t fear, we’ve highlighted these for you below. Whilst the Vatican City is incredibly small, sizing approximately half a square kilometre, there is an awful lot to see & do here. We wouldn’t expect to spend any less than an entire day exploring the best parts! Please see our blog post here: xxxx for the activities we most recommend. 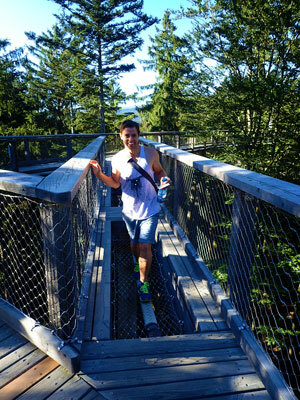 If you do spend a day here then there is time to see & do all of them at a casual pace. Secondly, timing is everything. Heading to the Vatican as early as possible puts you in pole position over the busloads of tourists who show up from 9am. Getting there before them means less queues & more personal space! 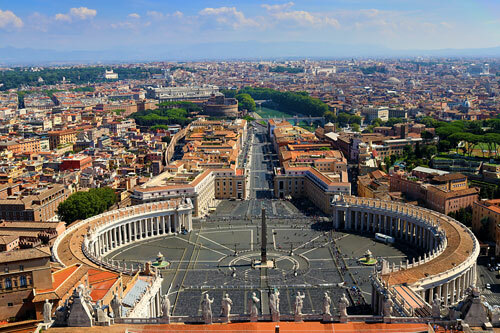 The best bet is to enter the Vatican City and explore St Peter’s Basilica first up. Hopefully the morning sun is still coming through the windows – it creates some spectacular photo opportunities. 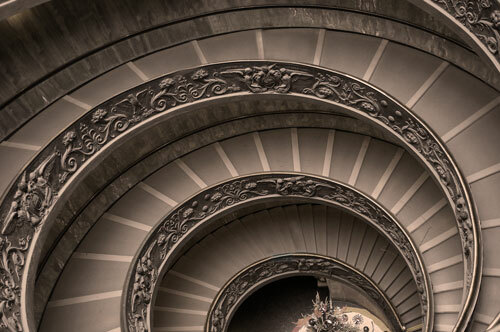 Buying your ticket to the Vatican museums (which includes the Sistine Chapel) in advance is also a great time saver. Skipping the queue with your ticket can save you up to an hour standing in line! And that leads to our first point. 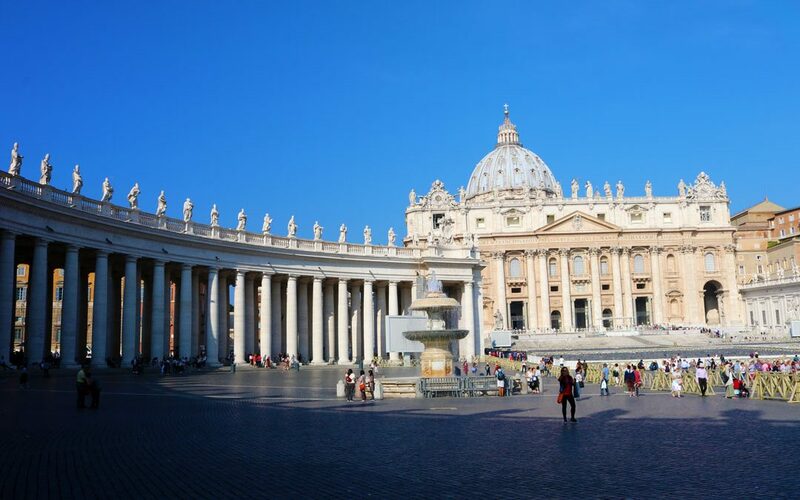 Know what you want to see & do in the Vatican City in advance. Some of our recommendations require moderate fitness levels & if you want to see and do a lot then be prepared to spend plenty of time on your feet. 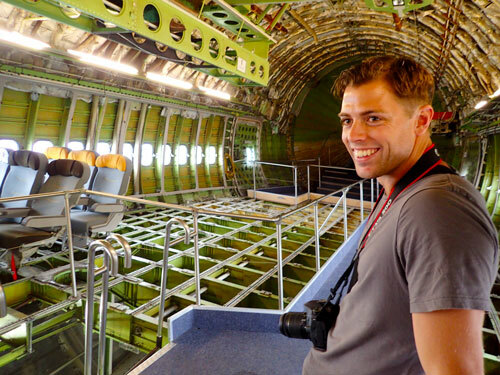 Things like the Scavi tour, which we missed out on, require you to book in advance. As some churches prohibit photography & film, we can assure you that cameras are welcome in almost the entirety of the Vatican City. The Sistine Chapel was the one place we found where photography was prohibited, so snap away! Running shoes & respectable clothing (covering shoulders) are essential. Despite the small size of the Vatican City there is a lot to do. If you wish to make the most of your trip here then we don’t think you will be in and out in less than 5 hours. And there aren’t a great deal of spots to sit and take a rest once you’re inside. Finally, and this is the most important point, eat a decent breakfast before heading in. And make sure to pack some water & snacks. There are very limited (we will go as far as to say ‘non-existent’) opportunities to get food once you are inside the city and you don’t particularly want to leave and return just for lunch. And if you’re on your feet for 5 hours then you’ll need something to keep you going. If you aren’t confident doing the Vatican City yourself, there are reputable tour guides who can take you around for the day. 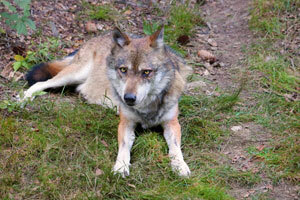 The going rate is around 120 – 150 euros. They will ensure you get the most out of your day and ensure you don’t miss any details that regular visitors may overlook. Alternatively, group tours can be booked inside the Vatican City if you are more budget conscious. We hope this helps you get the most out of your experience in the Vatican City. Let us know if you have any additional information you think we might have missed! 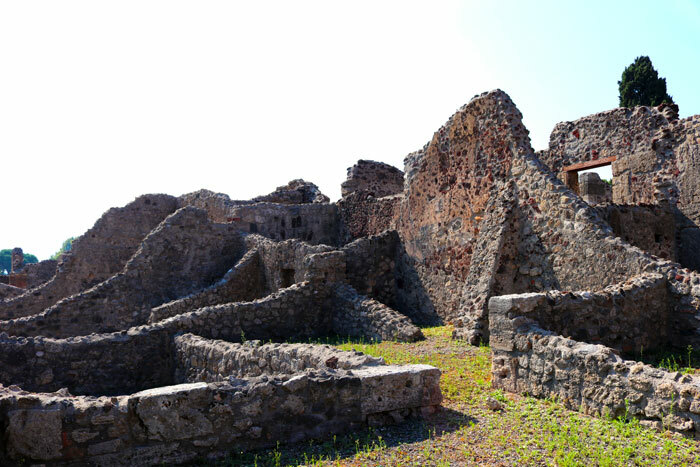 Pompeii is a great destination for a day trip and it’s proximity to Napoli. 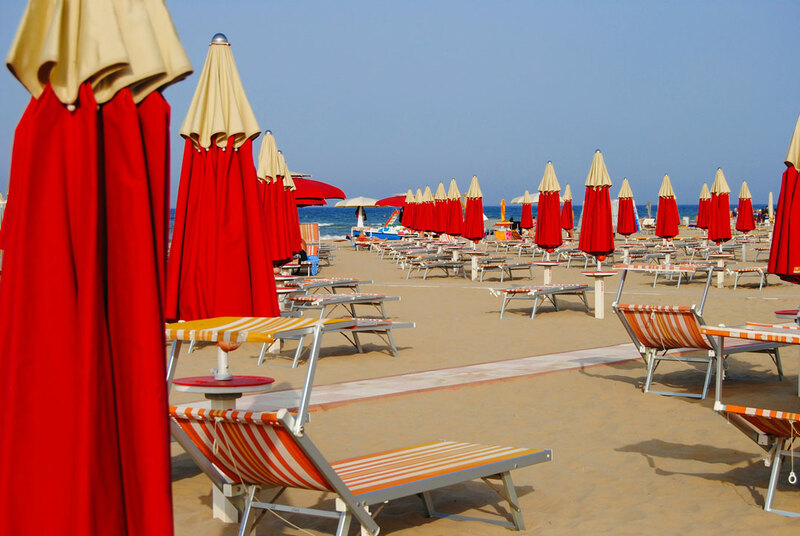 So it shouldn’t be too difficult to schedule into your Italy trip. If you are travelling on a budget, we cannot recommend AreA Domus B&B highly enough. 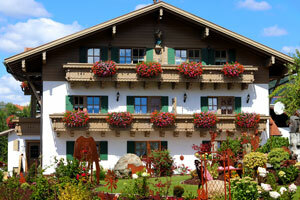 A large double room with private parking, excellent WIFI & breakfast (well it is a B&B) was only 50 euros per night. 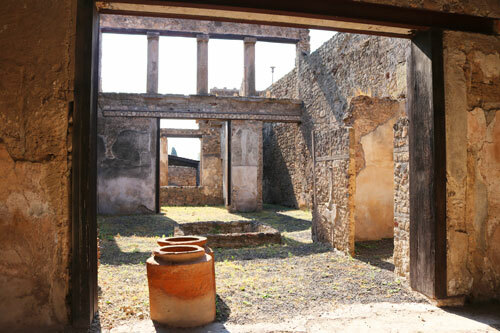 Even better, the location is a mere 10-15 minute walk from the Pompeii ruins. The accommodation is very affordable due to the shared bathrooms (we didn’t have to share during our stay) and Google Maps had a slightly difficult time navigating us there at night. The cost of entry to the ruins is 13 euros for an adult is very reasonable and the ruins were a great experience. Certainly worth the while to see the ruins we have all heard so much about. The ruins are ‘as they were’ and excavation works are still ongoing throughout the site. The ticket price includes a detailed map and guide, so you can avoid walking around every street when there is little to take in. For those not using a tour guide and not so good with maps, there are several offline guides that you can take a long to use in conjunction with your map. 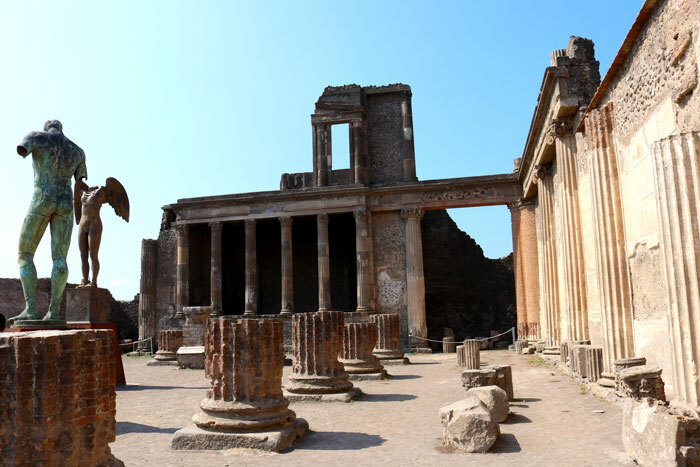 For smartphone users, the app Pompeii – A Day in the Past is available in both Apple & Google Play stores for a small fee and provides a little more detailed information. You will need to download it in advance though as the app is 115MB. There is also plenty of information available giving an insight into life at the time of the eruption. For those not entirely sold on the history & archaeological aspect, there are some additions to the site that provide a little bit of added interest. The bronze statues by various artists certainly made the visit more interesting and there is a musical history of artists who have played in the amphitheatre there, although we hastily skipped this part! The ruins are spread over a huge area, so ensure you wear suitable footwear as you will be covering a significant distance during the day. It is also worth noting that there is very limited shade inside the grounds so pack lightly but sensibly. 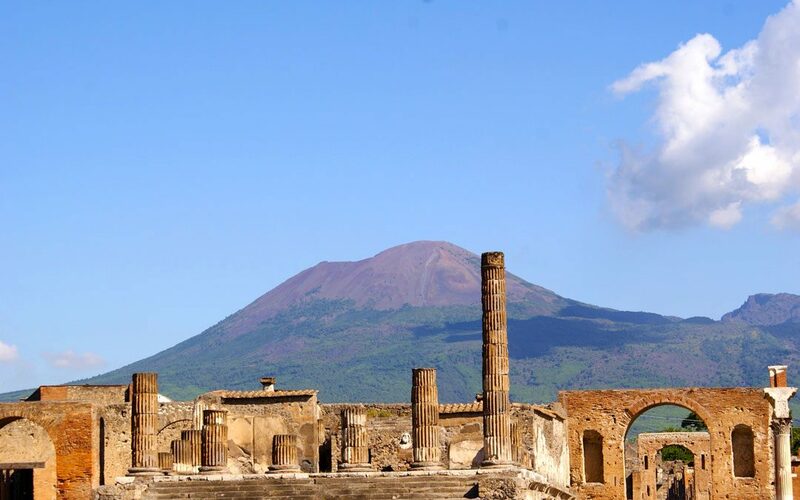 If you are planning to come to Pompeii only for a day trip then bear in mind that there won’t be a great deal of time for any additional activities. We explored the most interesting 80% of the ruins and we still spent 4.5 hours here. If the day of your visit is forecast for heavy rain then we would suggest trying to adjust your schedule to do this on a drier day. Unfortunately, the most interesting parts of the ruins are swarming with tourists. Not ideal for taking idiot free photographs. Expect to see them queue up to get an original photo posing with bronze penises etc. The line for the brothel (yep, oldest profession in the world) was huge. It took us around half an hour to battle to the front. And we were somewhat disappointed by it, it held very little intrigue and apart from concrete beds and a few damaged, suggestive paintings, there wasn’t a lot to it. Due to the small size of the building only 10 people are permitted inside at any time and with the large numbers you are more or less forced through in about 30 seconds to keep the flow up, so don’t even bother trying to snap a photo – you just won’t get the opportunity. We thought that there were much more interesting areas of the ruins. Fitting with this section, there were also far fewer corpses than we had expected. 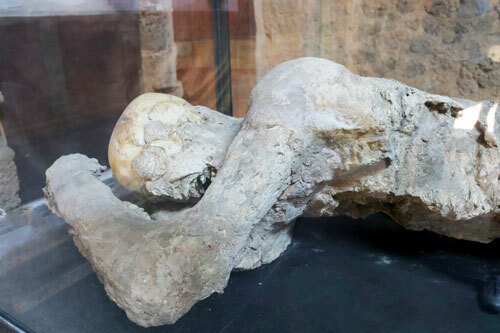 We found about eight preserved bodies during our visit, we had expected to see more. 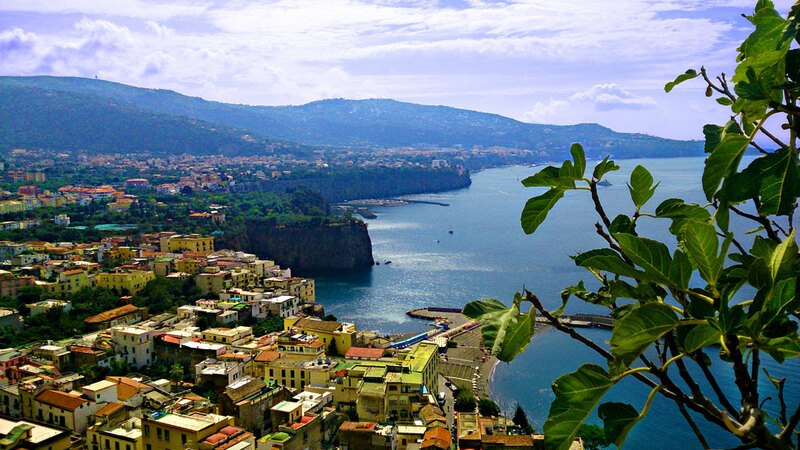 When we do return to this area of Italy, we will be spending a little more time in the area. 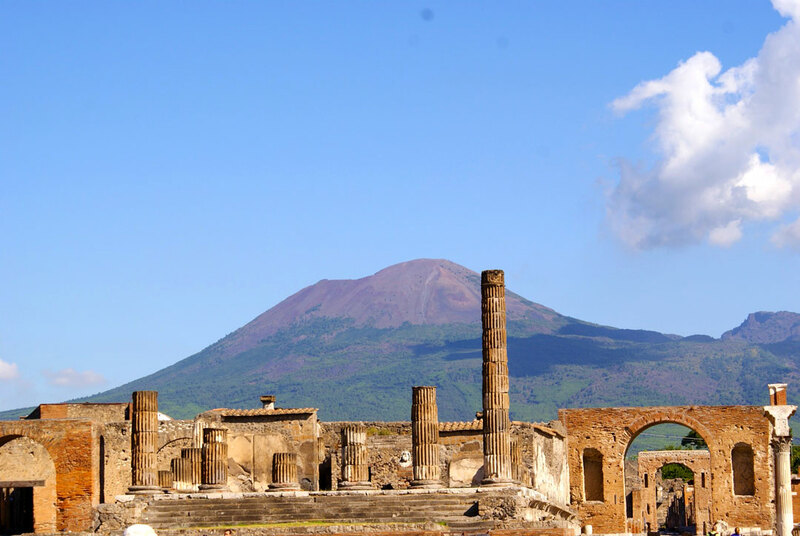 Not necessarily in Pompeii, but we intend to hike up & do a tour of Mount Vesuvius as a minimum. The opportunity to hike up Europe’s most active volcano is one thing we wish we had done here having climbed other active volcanoes in the past! If this is something that appeals to you then please check out the most comprehensive guide available here.